In my blog post addressing inbound vs outbound marketing, I wrote about the difficulties of marketing in general and the particular issues with the same-old, same-old of our interruptive marketing methodology. Old models have us put energy into multiple ways of interrupting the flow and attention of potential clients. ​The thought is we want them to stop looking at what they want and devote that focus toward what we want. I’d like to turn my attention to a different model of marketing, one that feels much more natural to us at Web Canopy Studio. How much of our current marketing strategies are merely slightly upgraded versions of Fuller Brush or encyclopedia sales tricks? ​Instead of going door-to-door or selling out of the back of our car we’ve figured out how to piggy-back our advertising on other items that end up in nearly every home: t.v., radio, and print. ​Add in email, SMS, and mobile technology and it seems like sales messages follow us wherever we go. With this pervasive inundation it’s no wonder we work so hard to ignore ads and marketing efforts. THIS is where Inbound, or self-directed, marketing comes in. When you are not thinking as a marketer, what do you spend your time researching or reading about online? Perhaps you are trying to find the last issue in the origin story of your favorite comic book character. Or maybe it's sports stats or gluten-free recipes. Perhaps you have a question you are trying to get answered for your work or organization. Let’s think for a moment from the standpoint of a average online user or shopper. If these are the kinds of questions we start with it gets easier to understand how inbound marketing works. Instead of getting in your customer’s face with your programs, put time into the following types of activities. Who is your ideal buyer? You probably have a few of them depending on your products and services. Spend some time creating personas for each of your ideal buyers and then creating content with each of these buyers in mind. Blogging: When people are searching for answers to their questions or to satisfy their curiosity, most of what comes up in search results are blog posts. Be sure that they are able to find you - your products, your opinions, your value, your expertise - by creating educational content that speaks to them and answers their questions. Social media: Share remarkable content and valuable information on the social web, engage with your prospects, and put a human face on your organization. Interact on the networks where your ideal buyers spend their time. Keywords: Your customers begin their buying process online, usually by using a search engine to follow their curiosity and answer their questions. Be sure you’re appearing prominently when they search. To get there, you need to carefully, analytically pick keywords, optimize your pages for search rankings, create content, and build links around the terms your ideal buyers are searching for. Pages:You must optimize your website to appeal to and speak with your ideal buyers. Transform your website into a resource of helpful content to entice the right strangers to visit your pages. 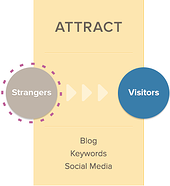 Once you’ve got visitors to your site, the next step is to convert those visitors into leads by gathering their contact information. At the very least, you’ll need their email addresses. ​Anymore contact information is the most valuable currency there is to the online marketer. In order for your visitors to offer up that currency willingly, you need to offer them something in return. ​That “payment” comes in the form of content, like eBooks, whitepapers, or tip sheets -- whatever information would be interesting and valuable to each of your personas. Calls-to-Action: Calls-to-action are buttons or links that encourage your visitors to take action, like “Download a Whitepaper” or “Attend a Webinar.” If you don’t have enough calls-to-action, or if the action to which you are calling your visitors aren’t enticing enough, you won’t generate any leads. 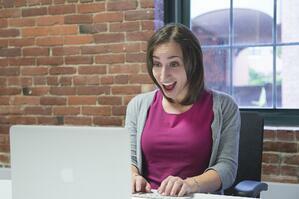 Landing Pages: When a website visitor clicks on a call-to-action, they should then be sent to a landing page. A landing page is where the offer in the call-to-action is fulfilled, and where the prospect submits information that your sales team can use to begin a conversation. 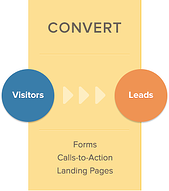 When website visitors fill out forms on landing pages, they typically become leads. Forms: In order for visitors to become leads, they must fill out a form and submit their information. Optimize your form to make this step of the conversion process as easy as possible. 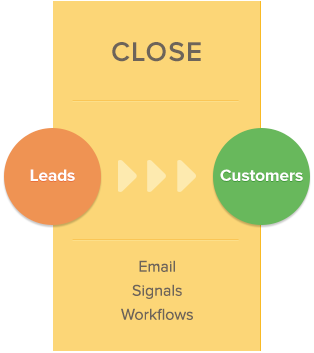 Contacts: Keep track of the leads you're converting in a centralized marketing database. Having all your data in one place, preferably web-based and available to your sales AND marketing folks, helps you make sense out of every interaction you’ve had with your contacts - be it through email, a landing page, social media, or otherwise - and how to optimize your future interactions to more effectively attract, convert, close, and delight your buyer personas. Lead Scoring: How do you evaluate the quality of a lead and their likelihood of becoming a customer? There are techniques for scoring this likelihood so that everyone on the sales team understands where any particular lead is at any given time. Email: What do you do if a visitor clicks on your call to action, fills out a landing page, or downloads your whitepaper, but still isn’t ready to become a customer? A series of emails focused on useful, relevant content can build trust with a prospect and help them become more ready to buy. Closed-loop Reporting: This is a fancy way to talk about making sure sales and marketing folks talk to each other regularly and meaningfully. This is more than just making announcements and sending memos; it’s about intentional planning between colleagues who want to address buyer needs over the course of a customer’s lifecycle. This may be the largest departure from the old door-to-door sales philosophy. These days the notion of gaining repeat customers and building years-long relationships with them is crucial. 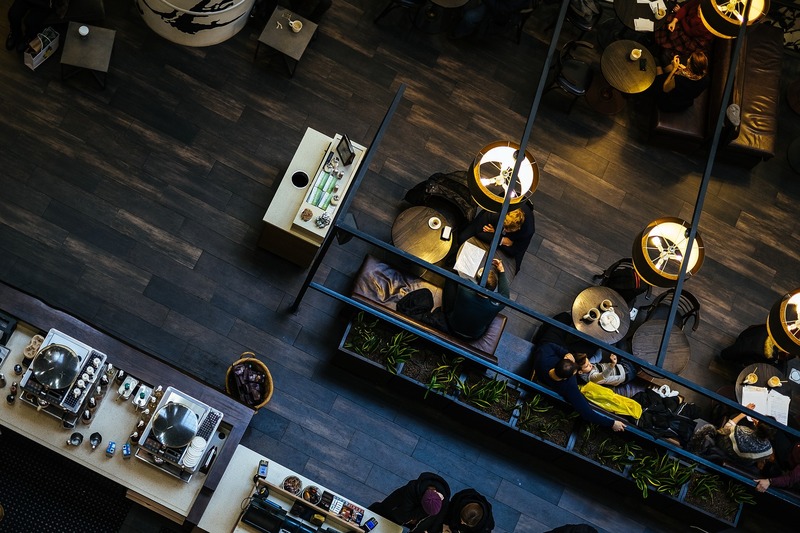 ​Brand loyalty now has an evangelistic connotation where our happy customers will move beyond simply telling their physical friends and neighbors, and will post their positive experiences online for a world of virtual connections to read. Smart Calls-to-Action: These present different users with offers that change based on buyer persona and customer lifecycle stage. Social Media: Using various social platforms gives you the opportunity to provide real-time customer service. This medium allows us to address problems quickly and acknowledge customer loyalty with ease. 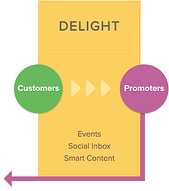 Email and Marketing Automation: Providing your existing customers with remarkable content can help them achieve their own goals, as well as introduce new products and features that might be of interest to them. To conclude, much of the core marketing hasn’t changed. To do it well means we’re connecting with real people, who have real needs, and addressing their needs with our products and services. ​What has changed are some of the ways we start that relationship and continue it over time. Inbound vs outbound marketing is more than just window dressing the same-old methods or updating the types of vacuums or brooms we cart around door-to-door. ​It’s about rethinking how we interact with our clients, and being mindful of their journey as a buyer.